§ 19-302 Permit Requirements by Other Government Entities. § 19-303 Erosion and Sediment Control During Regulated Earth Disturbance Activities. § 19-304 Nonstructural Project Design (Sequencing to Minimize Stormwater Impacts). § 19-305 Groundwater Recharge (Infiltration/Recharge/Bioretention). § 19-306 Water Quality Requirements. § 19-307 Streambank Erosion Requirements. § 19-308 Stormwater Management Districts. Applicants proposing regulated activities in the Schuylkill River watershed which do not fall under the exemption criteria shown in § 19-402 shall submit a drainage plan consistent with the Schuylkill River Watershed Stormwater Management Plan to the Borough of Shillington for review. These criteria shall apply to the total proposed development even if development is to take place in stages. The applicant is required to evaluate practicable alternatives to the surface discharge of stormwater, the creation of impervious surfaces and the degradation of waters of the commonwealth and must maintain as much as possible the natural hydrologic regime. The drainage plan must be designed consistent with the sequencing provisions of § 19-304 to ensure maintenance of the natural hydrologic regime and to promote groundwater recharge and protect groundwater and surface water quality and quantity. The drainage plan designer must proceed sequentially in accordance with Part 3of this chapter. Existing points of concentrated drainage that discharge onto adjacent property shall not be altered in any manner which could cause property damage without permission of the affected property owner(s) and shall be subject to any applicable discharge criteria specified in this chapter. Areas of existing diffused drainage discharge shall be subject to any applicable discharge criteria in the general direction of existing discharge, whether proposed to be concentrated or maintained as diffused drainage areas, except as otherwise provided by this chapter. If diffused drainage discharge is proposed to be concentrated and discharged onto adjacent property, the applicant must document that adequate downstream conveyance facilities exist to safely transport the concentrated discharge or otherwise prove that no erosion, sedimentation, flooding or other impacts will result from the concentrated discharge. Where a development site is traversed by existing watercourses, drainage easements shall be provided conforming to the line of such watercourses. The terms of the easement shall conform to the stream buffer requirements contained in § 19-306, Subsection 1D, of this chapter. Any stormwater management facilities regulated by this chapter that would be located in or adjacent to waters of the commonwealth or wetlands shall be subject to approval by PaDEP through the joint permit application process or, where deemed appropriate by PaDEP, the general permit process. When there is a question whether wetlands may be involved, it is the responsibility of the applicant or his agent to show that the land in question cannot be classified as wetlands; otherwise approval to work in the area must be obtained from PaDEP. Any alteration that affects stormwater flow directly or indirectly toward a PennDOT facility shall be subject to PennDOT regulations. Minimization of impervious surfaces and infiltration of runoff through seepage beds, infiltration trenches, etc., are encouraged, where soil conditions permit, to reduce the size or eliminate the need for detention facilities or other structural BMPs. Roof drains shall not be connected to impervious surfaces in order to promote overland flow and infiltration/percolation of stormwater where advantageous to do so. When site conditions preclude infiltration/percolation, then it shall be permitted on a case-by-case basis by the Borough of Shillington. All stormwater runoff shall be treated for water quality. Transference of runoff to or from an EV/HQ watershed is prohibited unless otherwise authorized by the DEP, DRBC or SRBC. Permits must comply with any and all applicable local, county, state and federal regulations. No regulated earth disturbance activities within the Borough of Shillington shall commence until the Borough of Shillington receives an approval from the Conservation District of an erosion and sediment control plan for construction activities. DEP has regulations that require an erosion and sediment control plan for any earth disturbance activity of 5,000 square feet or more, under 25 Pa. Code § 102.4(b). In addition, under 25 Pa. Code Chapter 92, a DEP NPDES construction activities permit is required for regulated earth disturbance activities. Evidence of any necessary permit(s) for regulated earth disturbance activities from the appropriate DEP regional office or County Conservation District must be provided to the Borough of Shillington. The issuance of an NPDES construction permit [or permit coverage under the statewide general permit (PAG-2)] satisfies the requirements § 19-303, Subsection 1. A copy of the erosion and sediment control plan and any required permit, as required by DEP regulations, shall be available at the project site at all times. Areas proposed for infiltration BMPs shall be protected from sedimentation and compaction during the construction phase to maintain maximum infiltration capacity. Infiltration BMPs shall not be constructed nor receive runoff until the entire contributory drainage area to the infiltration BMP has achieved final stabilization. For projects disturbing one acre or more, the design of all regulated activities shall include evaluation of practicable alternatives to the surface discharge of stormwater, the creation of impervious surfaces, and the degradation of waters of the commonwealth and must maintain as much as possible the natural hydrologic regime of the site. An alternative is practicable if it is available and capable of being done after taking into consideration cost, existing technology and logistics in light of overall project purposes and other municipal requirements. All practicable alternatives to the discharge of stormwater are presumed to have less adverse impact on quantity and quality of waters of the commonwealth unless otherwise demonstrated. Prepare an existing resource and site analysis map (ERSAM), showing environmentally sensitive areas, including, but not limited to, steep slopes, ponds, lakes, streams, wetlands, hydric soils, vernal pools, floodplains, stream buffer zones, Hydrologic Soil Groups A and B (areas conducive to infiltration), special geologic features, any existing recharge areas and any other requirements outlined in the Municipal Subdivision and Land Development Ordinance. Establish appropriate buffers for each of the delineated environmentally sensitive areas per the Municipal Zoning Ordinance [Chapter 27]. (See § 19-306, Subsection 1D, for stream buffers and § 19-310, Subsection 2B, for special geologic feature buffers). Prepare a draft project layout avoiding sensitive areas identified in § 19-304, Subsection 2A. Identify site-specific existing conditions' drainage areas, discharge points, recharge areas and Hydrologic Soil Groups A and B. Evaluate Nonstructural Stormwater Management Alternatives. Break up large impervious surfaces. Satisfy infiltration objective (§ 19-305) and provide for stormwater pretreatment prior to infiltration. Pretreatment may not be necessary for rooftop runoff which enters the infiltration facility directly from a roof leader. Satisfy water quality (§ 19-306) and stream bank erosion protection objectives (§ 19-307). Determine what management district the site falls into (Appendix D) and conduct an existing conditions' runoff analysis. Editor's Note: Appendix D is included as an attachment to this chapter. Prepare final project design to maintain existing conditions' drainage areas and discharge points, to minimize earth disturbance and impervious surfaces, and, to the maximum extent possible, to ensure the remaining site development has no surface or point discharge. Conduct a proposed conditions' runoff analysis based on the final design and to meet the release rate and in turn the overbank flow and extreme event requirements (§ 19-308). Manage any remaining runoff through treatment prior to discharge, as part of detention, bioretention, direct discharge or other structural control. Maximizing the groundwater recharge capacity of the area being developed is required. Design of the infiltration stormwater management facilities shall give consideration to providing groundwater recharge to compensate for the reduction in the percolation that occurs when the ground surface is disturbed or impervious surface is created. It is recommended that roof runoff be directed to infiltration BMPs which can be overdesigned to compensate for the infiltration losses due to parking areas. It is recommended that roof runoff be directed to infiltration BMPs which may be designed to compensate for the runoff from parking areas. These measures are required to be consistent with § 19-103 and take advantage of utilizing any existing recharge areas. Infiltration may not be feasible on every site due to site-specific limitations such as soil type. If it cannot be physically accomplished, due to seasonal high-water table, soil permeability rate, soil depth or setback distances from special geologic features, then the design professional shall be responsible to show that this cannot be physically accomplished. If it can be physically accomplished, then the volume of runoff to be infiltrated shall be determined from § 19-305, Subsection 2A(3), depending on demonstrated site conditions and shall be the greater of the two volumes. Regulated activities will be required to infiltrate, where site conditions permit, a portion of the runoff created by the development as part of an overall stormwater management plan designed for the site. The volume of runoff to be infiltrated shall be determined from § 19-305, Subsection 2A(3)(a) or (b), depending upon demonstrated site conditions. A minimum depth of 24 inches between the bottom of the BMP and the limiting zone. An infiltration and/or percolation rate sufficient to accept the additional stormwater load and drain completely as determined by field tests conducted by the applicant's design professional. The infiltration facility shall be capable of completely infiltrating the required retention (infiltration) volume within four days (96 hours). Pretreatment shall be provided prior to infiltration. 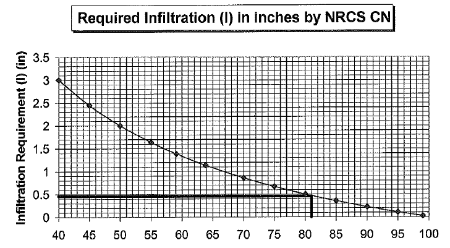 The NRCS runoff equation shall be utilized to calculate infiltration requirements (I) in inches. 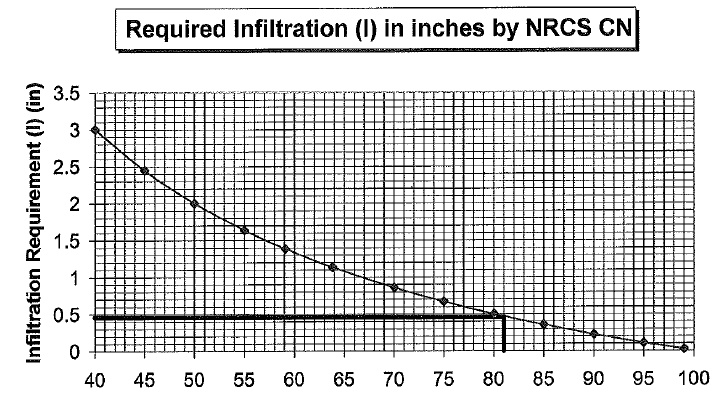 SCS (NRCS) curve number of existing conditions contributing to the infiltration facility. This equation is displayed graphically in, and the infiltration requirement can be determined from, Figure 305.1. It has been determined that infiltrating 0.46 inch of runoff from the impervious areas will aid in maintaining the hydrologic regime of the watershed. However, the rounded number 0.5 inch will be used. Annual Recharge - Water Budget Approach. If the goals of § 19-305, Subsection 2A(3)(a), cannot be achieved, then 0.5 inch of rainfall shall be infiltrated from all impervious areas, up to a an existing site conditions' curve number of 81. Above a curve number of 81, Equation 305.1 or the curve in Figure 305.1 should be used to determine the infiltration requirement. Analyze hydrologic soil groups as well as natural and man-made features within the site to determine general areas of suitability for infiltration practices. In areas where development on fill material is under consideration, conduct geotechnical investigations of subgrade stability; infiltration is not permitted to be ruled out without conducting these tests. Provide field tests, such as double-ring infiltrometer or hydraulic conductivity tests (at the level of the proposed infiltration surface), to determine the appropriate hydraulic conductivity rate. Percolation tests are not recommended for design purposes. Design the infiltration structure for the required retention (Rev) volume based on field-determined capacity at the level of the proposed infiltration surface. If on-lot infiltration structures are proposed by the applicant's design professional, it must be demonstrated to the Borough of Shillington that the soils are conducive to infiltrate on the lots identified. The design of all facilities over Karst shall include an evaluation of measures to minimize adverse effects. Stormwater Hotspots. Following is a list of examples of designated hotspots. If a site is designated as a hotspot, it has important implications for how stormwater is managed. First and foremost, untreated stormwater runoff from hotspots shall not be allowed to recharge into groundwater where it may contaminate water supplies. Therefore, the Rev requirement shall NOT be applied to development sites that fit into the hotspot category (the entire WQv must still be treated). Second, a greater level of stormwater treatment shall be considered at hotspot sites to prevent pollutant washoff after construction. The EPA's NPDES stormwater program requires some industrial sites to prepare and implement a stormwater pollution prevention plan. Vehicle salvage yards and recycling facilities. Vehicle service and maintenance facilities. Vehicle and equipment cleaning facilities. Fleet storage areas (bus, truck, etc.). Industrial sites (based on Standard Industrial Codes). Facilities that generate or store hazardous materials. Other land uses and activities as designated by an appropriate review authority. Residential streets and rural highways. Pervious areas, except golf courses and nurseries [which may need an integrated pest management (IPM) plan]. While large highways [average daily traffic volume (ADT) greater than 30,000] are not designated as a stormwater hotspot; it is important to ensure that highway stormwater management plans adequately protect groundwater. Caution shall be exercised where infiltration is proposed in source water protection areas as defined by the Borough of Shillington or Water Authority. Infiltration facilities shall be used in conjunction with other innovative or traditional stormwater control facilities that are found within the PADEP State BMP Manual. Caution shall be exercised where salt or chloride (municipal salt storage) would be a pollutant since soils do little to filter this pollutant and it may contaminate the groundwater. The qualified design professional shall evaluate the possibility of groundwater contamination from the proposed infiltration facility and perform a hydrogeologic justification study if necessary. The infiltration requirement in high-quality or exceptional-value waters shall be subject to the Department's Chapter 93 Antidegradation Regulations. Dependant upon certain land uses or hotspots, an impermeable liner will be required in detention basins where the possibility of groundwater contamination exists. A detailed hydrogeologic investigation may be required by the Borough of Shillington. The Borough of Shillington shall require the applicant to provide safeguards against groundwater contamination for land uses that may cause groundwater contamination should there be a mishap or spill. One hundred feet from water supply wells. Ten feet downslope or 100 feet upslope from building foundations. Fifty feet from septic system drainfields. Fifty feet from a geologic contact with carbonate bedrock, unless a preliminary site investigation is done in the carbonate bedrock to show the absence of special geologic features within 50 feet of the proposed infiltration area. One hundred feet from the property line, unless documentation is provided to show all setbacks from wells, foundations and drainfields on the neighboring property will be met. The applicant shall comply with the following water quality requirements of this Part. Developed areas shall provide adequate storage and treatment facilities necessary to capture and treat stormwater runoff. The infiltration volume computed under § 19-305 may be a component of the water quality volume if the applicant chooses to manage both components in a single facility. If the infiltration volume is less than the water quality volume, the remaining water quality volume may be captured and treated by methods other than infiltration BMPs. The required water quality volume (WQv) is the storage capacity needed to capture and treat a portion of stormwater runoff from the developed areas of the site. Total contributing drainage area to the water quality BMP (acres). 0.05 + 0.009(I), where I is the percent of the area that is impervious surface [(impervious area/A)*100]. This volume requirement can be accomplished by the permanent volume of a wet basin or the detained volume from other BMPs. Release of water can begin at the start of the storm (i.e., the invert of the water quality orifice is at the invert of the facility). The design of the facility shall provide for protection from clogging and unwanted sedimentation. For areas within defined special-protection subwatersheds which include exceptional-value (EV) and high-quality (HQ) waters, and cold-water fisheries (CWF), the temperature and quality of water and streams shall be maintained. To accomplish the above, the applicant shall use innovative or traditional stormwater control facilities that are found within the PADEP State BMP Manual. If a perennial or intermittent stream passes through the site, the applicant shall create a stream buffer extending a minimum of 50 feet to either side of the top-of-bank of the channel. The buffer area shall be maintained with appropriate native vegetation (reference to Appendix H of the Pennsylvania Handbook of Best Management Practices for Developing Area for plant lists). If the applicable rear or side yard setback is less than 50 feet, the buffer width may be reduced to 25% of the setback to a minimum of 10 feet. If an existing buffer is legally prescribed (i.e., deed, covenant, easement, etc.) and it exceeds the requirements of this chapter, the existing buffer shall be maintained. This does not include lakes or wetlands. Evidence of any necessary permit(s) for regulated earth disturbance activities from the appropriate DEP regional office must be provided to the Borough of Shillington. The issuance of an NPDES construction permit [or permit coverage under the statewide general permit (PAG-2)] satisfies the requirements of § 19-306, Subsection 1A. In addition to control of the water quality volume, in order to minimize the impact of stormwater runoff on downstream streambank erosion, the primary requirement is to design a BMP to detain the proposed conditions' two-year, twenty-four-hour design storm to the existing conditions' one-year peak flow using the SCS Type II distribution. Additionally, provisions shall be made (such as adding a small orifice at the bottom of the outlet structure) so that the proposed conditions' one-year storm takes a minimum of 24 hours to drain from the facility from a point where the maximum volume of water from the one-year storm is captured, (i.e., the maximum water surface elevation is achieved in the facility). Release of water can begin at the start of the storm (i.e., the invert of the water quality orifice is at the invert of the facility). The minimum orifice size in the outlet structure to the BMP shall be a three-inch-diameter orifice, and a trash rack shall be installed to prevent clogging. On sites with small contributing drainage areas to this BMP that do not provide enough runoff volume to allow a twenty-four-hour attenuation with the three-inch orifice, the calculations shall be submitted showing this condition. Orifice sizes less than three inches can be utilized, provided that the design will prevent clogging of the intake. The Schuylkill River watershed has been divided into stormwater management districts as shown on the Management District Map in Appendix D.
In addition to the requirements specified in Table 308.1 below, the groundwater recharge (§ 19-305), water quality (§ 19-306), and streambank erosion control (§ 19-307) requirements shall be implemented. Standards for managing runoff from each subarea in the Schuylkill River watershed for the two-year through one-hundred-year design storms are shown in Table 308.1. Development sites located in each of the districts must control proposed conditions'; runoff rates to existing conditions' runoff rates for the design storms in accord with Table 308.1. All areas, regardless of the release rate, must still meet the requirements of the groundwater recharge criteria (§ 19-305), water quality criteria (§ 19-306), and streambank erosion criteria (§ 19-307). General. Proposed condition rates of runoff from any regulated activity shall not exceed the peak release rates of runoff prior to development for the design storms specified on the Stormwater Management District Watershed Map (Appendix D) and in § 19-308 of this chapter. District Boundaries. The boundaries of the stormwater management districts are shown on an official map that is available for inspection at the municipal office. A copy of the official map at a reduced scale is included in the Appendix D. The exact location of the stormwater management district boundaries as they apply to a given development site shall be determined by mapping the boundaries using the two-foot topographic contours (or most-accurate data required) provided as part of the drainage plan. Sites Located in More Than One District. For a proposed development site located within two or more stormwater management district category subareas, the peak discharge rate from any subarea shall meet the management district criteria for which the discharge is located, as indicated in § 19-308. The calculated peak discharges shall apply regardless of whether the grading plan changes the drainage area by subarea. An exception to the above may be granted if discharges from multiple subareas recombine in proximity to the discharge site. In this case, peak discharge in any direction shall follow Management District A criteria, provided that the overall site discharge meets the management district criteria for the district in which the discharge is located. Off-Site Areas. Off-site areas that drain through a proposed development site are not subject to release rate criteria when determining allowable peak runoff rates. However, on-site drainage facilities shall be designed to safely convey off-site flows through the development site. Site Areas. Where the site area to be impacted by a proposed development activity differs significantly from the total site area, only the proposed impact area utilizing stormwater management measures shall be subject to the management district criteria. In other words, unimpacted areas bypassing the stormwater management facilities would not be subject to the management district criteria. Stormwater runoff from all development sites with a drainage area of greater than 200 acres shall be calculated using a generally accepted calculation technique that is based on the NRCS Soil Cover Complex Method. Table 309-1 summarizes acceptable computation methods, and the method selected by the design professional shall be based on the individual limitations and suitability of each method for a particular site. The Rational Method shall be used to estimate peak discharges from drainage areas that contain less than 200 acres. The Soil Cover Complex Method shall be used for drainage areas greater than 200 acres. Note: Successors to the above methods are also acceptable. These successors include WINNTR55 for TR55 and WINTR20 for TR20 and SWMM. All calculations consistent with this chapter using the Soil Cover Complex Method shall use the appropriate design rainfall depths for the various return period storms according to the region in which they are located as presented in Table B-1 in Appendix B of this chapter. If a hydrologic computer model such as PSRM or HEC-1/HEC-HMS is used for stormwater runoff calculations, then the duration of rainfall shall be 24 hours. The rainfall distribution should reference to NOAA Atlas 14. For the purposes of existing conditions' flow rate determination, undeveloped land shall be considered as "meadow" in good condition, unless the natural ground cover generates a lower curve number or Rational "C" value (i.e., forest), as listed in Table B-1 or B-2 in Appendix B of this chapter. All calculations using the Rational Method shall use rainfall intensities consistent with appropriate times-of-concentration for overland flow and return periods from the NOAA Atlas 14 Precipitation-Frequency Atlas of the United States (2004, revised 2006). Times-of-concentration for overland flow shall be calculated using the methodology presented in Chapter 3 of Urban Hydrology for Small Watersheds, NRCS, TR-55 (as amended or replaced from time to time by NRCS). Times-of-concentration for channel and pipe flow shall be computed using Manning's Equation. The NRCS lag equation divided by 0.6 is an acceptable method for Tc in undeveloped areas. Runoff Curve Numbers (CN) for both existing and proposed conditions to be used in the Soil Cover Complex Method shall be obtained from Table B-1 in Appendix B of this chapter. Runoff coefficients (c) for both existing and proposed conditions for use in the Rational Method shall be obtained from Table B-2 in Appendix B of this chapter. Where uniform flow is anticipated, the Manning Equation shall be used for hydraulic computations and to determine the capacity of open channels, pipes, and storm sewers. Values for Manning's roughness coefficient (n) shall be consistent with Table B-3 in Appendix B of this chapter. Full flow shall be assumed for closed conduits. Outlet structures for stormwater management facilities shall be designed to meet the performance standards of this chapter using any generally accepted hydraulic analysis technique or method. The design of any stormwater detention facilities intended to meet the performance standards of this chapter shall be verified by routing the design storm hydrograph through these facilities using the Storage-Indication Method. For drainage areas greater than 200 acres in size, the design storm hydrograph shall be computed using a calculation method that produces a full hydrograph (i.e., TR-20, TR-55, HEC-1, PSRM). The Borough of Shillington may approve the use of any generally accepted full hydrograph approximation technique that shall use a total runoff volume that is consistent with the volume from a method that produces a full hydrograph. Any facilities that constitute water obstructions (e.g., culverts, bridges, outfalls, or stream enclosures), water encroachments, and any work involving wetlands governed by PaDEP Chapter 105 regulations (as amended or replaced from time to time by PaDEP) are subject to PaDEP Chapter 105 regulations. Adequate erosion protection shall be provided along all open channels and at all points of discharge (DEP Erosion and Erosion, Sediment and Pollution Control Manual). The Borough of Shillington reserves the right to disapprove any design that would result in construction in or continuation of a stormwater problem area. All wet basin designs shall incorporate biologic minimization controls consistent with the West Nile Guidance found in Appendix F.
No stormwater detention facility shall be placed within 50 feet of a special geologic feature. No stormwater conveyance facility shall be constructed within 50 feet of a special geologic feature, unless it is constructed of durable pipe utilizing watertight joints. Privately owned detention facilities and BMPs should be situated such that lot lines do not divide the facility. Maintenance of an individual facility shall be the responsibility of only one lot owner, unless the facility is located in a common area maintained by a homeowners' association. Any stormwater management facility (i.e., detention basin) designed to store runoff and requiring a berm or earthen embankment required or regulated by this chapter shall be designed to provide an emergency spillway to handle flow up to and including the one-hundred-year proposed conditions and may be subject to PaDEP Chapter 105 regulations. The emergency spillway shall either be placed in undisturbed earth or constructed of concrete. Minimum grades for turf areas inside detention basins shall be 1%, and maximum side slopes of retention/detention basins shall be 33% (three units horizontally to one unit vertically). Depending upon the location and the intended use of the detention facilities during nonfunctioning times, a side slope of less than 33% for one or both slopes may be required by the Board of Supervisors. Side slopes shall be kept as close to the natural land contours as practical, but when a detention basin is to be maintained by a future residential lot owner, the maximum side slope shall be 25% (four units horizontally to one unit vertically). Where the outfall point of a proposed detention facility is located at a point subject to tailwater conditions, a tailwater elevation at the outfall point will need to be assumed when performing the detention facility routing calculations. The tailwater elevation assumed shall be based on the frequency of the storm being routed. For example, if a ten-year storm is being routed through the facility, the ten-year water surface elevation needs to be determined at the discharge point and assumed as the downstream tailwater condition. Outlet structures for underground detention facilities shall be provided within a reinforced concrete junction box. Flows through the junction box shall be attenuated with a concrete weir wall with adequately sized orifices. The dimensions of the weir wall should be designed to allow passage of the one-hundred-year post-development inflow without surcharging the junction box. Underground detention facilities which propose pipe storage as a means of detention shall be constructed of reinforced concrete pipe (RCP) or smooth-lined corrugated plastic pipe (SLCPP). Water surface area shall not exceed 1/10 of the tributary drainage area. Shoreline protection shall be provided to prevent erosion from wave action. Minimum normal water depth shall be four feet. If fish are to be used to keep the pond clean, a minimum of 1/4 of the pond area shall be a minimum of 10 feet deep. Facilities shall be provided to allow the pond level to be lowered by gravity flow for cleaning purposes and shoreline maintenance. Aeration facilities as may be required to prevent pond stagnation shall be provided. Design calculations to substantiate the effectiveness of these aeration facilities shall be submitted with final engineering plans. Agreements for the perpetual operation and maintenance of aeration facilities shall be prepared to the satisfaction of the Borough of Shillington. In the event that the water surface of the pond is to be raised for the purposes of storing water for irrigation or in anticipation of the evapotranspiration demands of dry weather, the volume remaining for storage of excess stormwater runoff shall still be sufficient to contain the design year storm runoff. The height of the dam shall not exceed 15 feet, unless approved by the Borough of Shillington and the Pennsylvania Department of Environmental Protection. The minimum top width of dams up to 15 feet in height shall be equal to 2/3 of the dam height, but in no case shall the top width be less than eight feet. The side slopes of the settled earth fill shall not be less than three horizontal to one vertical. A key trench at least two feet deep, or extending down to stable subgrade, whichever is deeper, of compacted relatively impervious material (Unified Soil Classification CL or ML). Minimum bottom width for the key trench shall be four feet. Maximum side slopes for the key trench shall be one horizontal to one vertical. A compacted impervious core at least eight feet wide at the top, having a maximum side slope of one horizontal to one vertical, shall extend for the full length of the embankment, and the top elevation shall be set at the design year water surface elevation. All pipes and culverts through dams shall have properly spaced anti-seep collars (minimum six-inch thick). Whenever a basin will be located in an area underlain by limestone, a geological evaluation of the proposed location shall be conducted to determine susceptibility to sinkhole formations. The design of all facilities over limestone formations shall include measures to prevent groundwater contamination and, where necessary, sinkhole formation. Soils used for the construction of basins shall have low-erodibility factors ("K" factors). The Borough of Shillington may require the installation of an impermeable liner in detention basins. The following standards shall apply to all low-volume detention basins. A low-volume detention basin is considered any man-made surface impoundment designed to provide no more than 0.10 acre-feet of storage between the lowest outlet elevation to the top of berm elevation and a maximum one-hundred-year ponding depth no greater than three feet. The minimum berm width shall be five feet. The side slopes of both the interior and exterior embankments shall be no steeper than two horizontal units to one vertical unit. Low-volume detention basins shall be designed to accommodate the one-hundred-year post-development storm such that the maximum water surface elevation is less than the emergency spillway elevation. Emergency spillways shall be designed to safely convey the one-hundred-year post-development basin inflow with a minimum six inches of freeboard above the water surface elevation. Infiltration testing shall be conducted in accordance with § 19-305, Subsection 2B. A minimum depth of 36 inches between the bottom of the infiltration facility and the limiting zone. The infiltration and/or percolation rate sufficient to accept the additional stormwater load and drain completely as determined by field tests conducted by the applicant's design professional. The infiltration facility shall be capable of completely infiltrating the required retention/detention volume within 24 hours. When stormwater runoff accesses the infiltration bed or trench via surface flow, the volume of runoff controlled by infiltration shall be limited to 25% of the detention volume required to satisfy § 19-308. This is in consideration of loss of function during freezing weather. There exists at least 18 inches between the top of the infiltration facility and the ground surface. An emergency overflow is provided capable of controlling the maximum year design storm for the watershed and district in which the facility is located when the infiltration facility is independent of the detention facility. The point of discharge of the emergency overflow shall be in accordance with the provisions of this chapter. The preferred point of discharge is into a detention or retention facility. Any proposed roadway drainage facilities shall be designed according to the more restrictive of PennDOT Design Manual Part II or the Borough of Shillington standards. Storm sewers must be able to convey proposed conditions' runoff from a twenty-five-year design storm without flooding inlets. At the Borough of Shillington's discretion, drainage facilities shall be designed to convey proposed conditions' runoff from the one-hundred-year design storm without flooding inlets in sag areas of streets. When designing storm sewers that discharge into a detention facility, a tailwater condition at the storm sewer discharge point needs to be assumed where applicable. The assumed tailwater elevation should be the equal to the detention facility water surface elevation resulting from whatever year design storm was used to design the storm sewer. For example, if the storm sewer is being designed to convey a twenty-five-year storm, the downstream tailwater elevation should be assumed as the twenty-five-year stormwater surface elevation of the detention facility. Subsurface drainage systems shall have manholes spaced at intervals not exceeding 400 feet and located wherever branches are connected or sizes are changed and wherever there is a change in alignment or grade. Inlets may be used instead of manholes when approved by the Borough Engineer. Storm sewer lines within street rights-of-way shall be located next to the curbline and shall parallel the curbline as far as practical. Subsurface drainage systems shall have curb inlets located at curb tangents on the uphill side of street intersections and at other locations as may be required by the Borough of Shillington as necessary to intercept runoff. Design and location of curb inlets shall be in accordance with Pennsylvania Department of Transportation Design Manual Part 2 and be approved by the Borough Engineer. All proposed inlets within curbed streets shall be designed such that the top of grate elevations are equal to the top of base course elevation to permit proper drainage of the streets prior to wearing course placement. Inlets shall be designed and located to prevent hazards to vehicles, bicycles and pedestrians. Reinforced concrete culvert pipe Class III or better, with rubber O-ring joints, shall be used for all storm sewer lines to be constructed within street rights-of-way. Minimum diameter shall be 15 inches. Smooth lined corrugated polyethylene pipe (SLCPP) may be used at the option of the subdivider for lines to be located on private property that will not be offered for dedication to the Borough of Shillington. If SLCPP is being proposed, as permitted in § 19-310, Subsection 3I, in areas underlain with limestone geology, watertight joints will be required within the storm sewer system. Only pipe joints which are capable of meeting the testing criteria outlined by ASTM D-3212 will be considered "watertight." All drainage facilities shall be maintained to retain their design capacity. Drainage facilities, including detention ponds, shall not convey water onto any existing or proposed public road right-of-way. Pipes and storm sewers shall have a minimum slope not less than 0.005 foot per foot. Permissible Velocities in Storm Pipe at Design Flow. Minimum: 2.5 feet per second. Maximum: 12.0 feet per second. The inflow inverts of the proposed inlets shall be no less than 0.2 foot above the outflow invert elevation. The inflow pipe(s) crown elevation(s) shall be equal to or above the crown elevation of the outflow pipe. In specific cases, this requirement may be waived at the discretion of the Borough Engineer. All proposed inlets within curbed streets shall be designed such that the top of grate elevation is equal to the top of base course elevation to permit proper drainage of the streets prior to wearing course placement. Storm sewer inlets proposed to be sumped shall be a minimum of six feet long and no deeper than six feet. Open channels shall be designed in accordance with the channel design procedures found in the Department of Environmental Protection, Bureau of Water Quality Protection, Erosion and Sediment Pollution Control Program Manual. All open channels shall be designed to convey the twenty-five-year stormwater flow. In addition, open channels shall be design to convey the one-hundred-year stormwater flow from emergency spillways and areas where damage to property would result. Open channels located adjacent to residential streets shall be limited to a top width of six feet, depth of 1.5 feet, and, if trapezoidal in cross section, a minimum bottom width of two feet. Open channels located along nonresidential streets, in side yards, rear yards, or open space shall be limited to a top width of 12 feet, depth of three feet, and, if trapezoidal in cross section, a minimum bottom width of two feet. Open channels located in side yards, rear yards, or open space shall provide a minimum of six inches of freeboard. The minimum longitudinal slope shall not be less than 0.010 foot per foot nor greater than 0.100 foot per foot. Any infiltration and water quality facilities proposed to meet the requirements of §§ 19-305 and 19-306 should be designed in a manner consistent with the requirements of the NPDES permit, if one is required. Design of the infiltration and water quality facilities should be in accordance with the guidelines provided in the Pennsylvania Stormwater Best Management Practices Manual, latest edition. All streets shall be designed as to provide for the discharge of surface water from their rights-of-way. The slope of the crown on proposed streets shall not be less than 1/4 inch per foot and not more than 1/2 inch per foot. The typical slope of the shoulder areas shall not be less than 3/4 inch per foot and not more than one inch per foot. Cross drainage in intersections or in tangent sections of roadway will not be permitted. Gutter flow shall not exceed 1/2 of the travel lane width.